19th November 2018: Portuguese employees are less likely than the average European employee to say that questionable workplace practices are acceptable, according to a survey by the Institute of Business Ethics, which looks at employees’ experiences of ethics at work. An important part of the survey is to establish whether employees are able to identify ethical issues relating to everyday choices that they might have to face in the workplace and whether they apply ethical values to their decision-making. To answer these questions, respondents to this survey were presented with nine common work-related scenarios and were asked whether or not they considered them acceptable. Pretending to be sick to take a day off; minor fiddling/exaggeration of travel expenses and charging personal entertainment to expenses are considered the most unacceptable practices Europe-wide, with Portuguese employees finding them more unacceptable than the European average (90% Europe vs. 97% Portugal, 89% vs. 92% and 89% vs. 94% respectively). Furthermore, while one fifth of European employees say that favouring friends and family when awarding contracts is acceptable, only one in ten of Portuguese employees say the same (19% vs. 9% respectively). This is the case even for behaviours that might be considered widespread, such as making personal phone calls from work (47% Europe vs. 33% Portugal) and using the internet for personal use during work hours (41% Europe vs. 33% Portugal). The Ethics at Work: 2018 survey of employees is the only one of its kind covering Europe which provides real insight into employees’ views on ethics across all sectors and job roles. 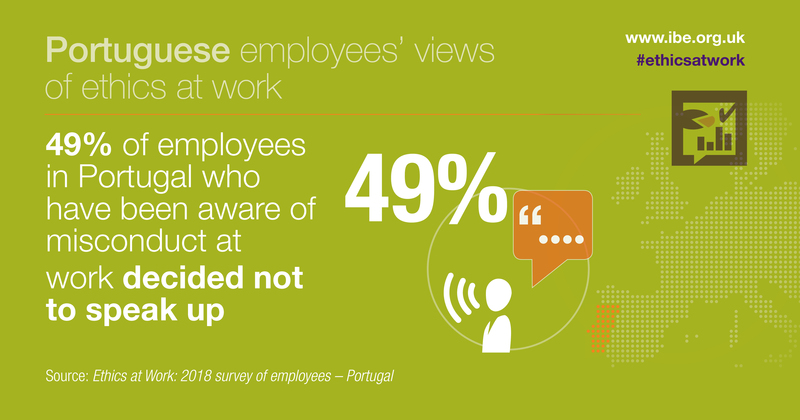 This new report by the IBE looks specifically at the data from employees in Portugal and compares it with other countries. The Survey, first introduced in the UK in 2005, asks employees how they experience ethical dilemmas in their day-to-day working lives. It looks at whether they have witnessed misconduct; whether they have reported it; and what have stopped them from doing so. It provides real insight into what supports employees in making ethical choices. Employees in Portugal are more likely to say that honesty is practiced always or frequently in their organisation’s daily operations than the European average (85% vs. 78% respectively). However, despite this positive finding, a third of Portuguese employees say they have been aware of ethical misconduct, compared to three in ten European employees who say the same (35% vs. 30% respectively). Additionally, a fifth of Portuguese employees (22%) have felt some form of pressure to compromise ethical standards in the past year compared to the European average of 16%. The IBE has surveyed British employees since 2005, but given that organisations are increasingly taking an integrated approach at the international level, we have expanded the number of countries included in the research to cover France, Germany, Ireland, Italy, Portugal, Spain, Switzerland and the UK within Europe. The survey was completed by a total of 6,119 respondents across the eight European countries. It was comprised of a representative sample of about 750 working adults aged 18+ in each country . The IBE purpose is to promote high standards of business behaviour based on ethical values, is an important partner to any business wanting to preserve its long-term reputation by doing business in the right way. Guendalina Dondé is Senior Researcher at the Institute of Business Ethics. She writes and researches on a range of business ethics topics for the IBE. Before joining the IBE, she collaborated in developing the code of ethics for the Italian Association of Management Consultants and worked for a European CSR Business Network in Brussels. She holds a Master’s degree in Business Ethics and CSR from the University of Trento in Italy. She is the author of the IBE survey report Corporate Ethics Policies and Programmes: 2016 UK and Continental Europe Survey and co-author of the 2017 IBE report Setting the Tone: a New Zealand perspective on Business Ethics, the 2017 TEI & IBE Ethics and Compliance Handbook, the 2016 IBE Codes of Business Ethics: examples of good practice and of the French and Italian editions of the 2015 IBE survey Ethics at Work: 2015 Survey of Employees. She is also responsible for reviewing corporate codes of ethics and related policies, benchmarking them against other organisations’. Católica Porto Business School is a school of the Catholic University in Portugal, known for the development of business professionals, focused on sustainability and respect for individuals. For over 25 years, the school has been training professionals in the area of Economics and Management for the global business context, who then follow national or international careers. The school sustains strong industry bonds, enabling a continuous adaptation of skills development according to market needs, resulting in an unceasing pace of innovation.